This story appears in the action sports/Summer 2018 issue of Sports Spectrum Magazine. Support this ministry and subscribe here. No female snowboarder boasts more accolades than Kelly Clark. Olympic gold medal. Numerous X Games gold medals. Multiple U.S. Open medals. Action Sport Athlete of the Year ESPY. Winningest woman in snowboarding history. First to land a 1080 in competition. And on and on and on. Her most cherished is the Olympic gold, won in the halfpipe at the 2002 Salt Lake City Games as an 18-year-old, marking the first gold medal for the host country that year. Her most hard-fought is the Olympic bronze from 2014, when she, as the last rider of the competition, needed to stomp a stellar run to find the podium — and did just that. But ranking right near the top is a medal the 34-year-old Clark received at the 2018 PyeongChang Games. Not something she won, because she actually finished fourth in her fifth and possibly final Olympic appearance. Rather, it was a medal given to her by a teammate, the newly crowned champion, Chloe Kim. The Order of Ikkos medal is something the U.S. Olympic Committee allows every Olympic medalist to give someone who has “influenced them and helped them in their journey.” It’s intended for coaches, as Ikkos was the first recorded Olympic coach in Ancient Greece. Kim, an 18-year-old primed to be the future of women’s snowboarding, handed hers to Clark. Similar sentiment was expressed from another compatriot, Arielle Gold, the 21-year-old who bested Clark for that PyeongChang bronze. If there’s an ideal way to retire from an Olympic sport, going out with a gold medal is it — at least by the world’s standards. But for Clark, these words spoken by teammates half her age validate an accomplished mission, one she set out on in 2010 after winning bronze at the Vancouver Games. “I looked around and realized I didn’t just want to have good competition results when I looked back at my career someday,” Clark told Sports Spectrum this past spring. “So I’ve really embraced, in this later part of my career, really mentoring and being available to contribute to other people’s success — which as a competitive athlete may not seem like the best idea. Clark credits nearly everything in her life to snowboarding. She first tried it at age 7, and later excelled in high school at Mount Snow Academy in Vermont before turning pro. It’s her community. It’s her lifestyle. “Snowboarding has given me such an incredible life experience,” she says. That includes giving her Jesus. The year was 2004, two seasons after winning her Olympic gold medal. She had just advanced to the finals of a competition when she overheard a conversation between two fellow riders, one girl consoling another who had failed to make the finals. The girls didn’t know Clark was in earshot; Clark didn’t exactly know what those words meant. But she couldn’t ignore them. She raced back to her hotel room, assuming a Bible would be sitting in the nightstand drawer. She opened it up, but had no clue what to make of the “God where art thou” text. So Clark tracked down the girl who spoke of God like she knew Him, and asked how she could know Him too. Those words changed Clark’s life. She immediately began to seek more of Christ. She devoured a daily devotional given to her by a Christ-following coach, and she tore through Rick Warren’s “Purpose Driven Life.” “That book was really foundational in just helping me understand who God was and what a relationship with Jesus could look like,” Clark says. Four months after hearing “God still loves you,” Clark gave her heart to the Lord. Liberated after shedding the idea of her identity being tied to performance, Clark’s performances prospered. She was already among the world’s elite halfpipe riders, but finding Jesus helped her escape a depression that had been setting in without her really knowing it. “When everything’s riding on a result of a performance, or especially a snowboarding event, you tend to be kind of conservative in your approach and you don’t want to take those risks because what if you do fall? So [discovering Christ has] honestly freed me up to be the forerunner and the progression leader in this sport for so many years. Because I can dream really big and I can fail, and it’s OK. Not a lot of people can say that,” Clark says. The mid-2000s were a time of rapid progression in snowboarding. Both men and women were literally soaring to new heights and attempting tricks at a new level of difficulty. Shaun White largely led the way for men, Clark for the women. She’s long been known for her amplitude (air out of the pipe), which led to her becoming the first woman to land a 1080 (three rotations in the air) in competition. Clark accomplished the feat at the 2011 Winter X Games and went on to dominate women’s halfpipe for much of the next five years. “You get out what you put in. I constantly invest in my career. I’m constantly learning new things, and as the sport changes, I have to do that as well. I love learning new things and getting pushed — I think that’s what’s been inspiring me these last few years,” she says. PyeongChang may have been Clark’s last Olympics, and if so, she leaves as one of only two U.S. women to compete at five Winter Olympics (the other is cross-country skier Kikkan Randall). In those appearances, Clark never finished lower than fourth (gold in ‘02, fourth in ‘06, bronze in ‘10, bronze in ‘14, fourth in ‘18). Outside of the Olympics, she owns the most X Games medals for a woman (14), eight U.S. Open gold medals and three FIS World Cup season titles. Many of those accolades were earned with Jesus on her board — literally. Right at the top edge of her Burton snowboard — accompanying other stickers displaying other sponsors — is “Jesus” in cursive letters. That placement is no accident. When snowboarders pose for photos on podiums, or appear on TV for interviews after competing, they always hold their boards close by. The idea is to get their sponsors in the shot, increasing brand recognition. With Jesus above all other logos, Clark unashamedly shows who’s at the top in her life. In doing so she’s been a constant witness for Christ in the world of snowboarding, where the Gospel isn’t always welcomed. Clark’s mission, since 2004, has been to impact the world around her instead of the world impacting her. 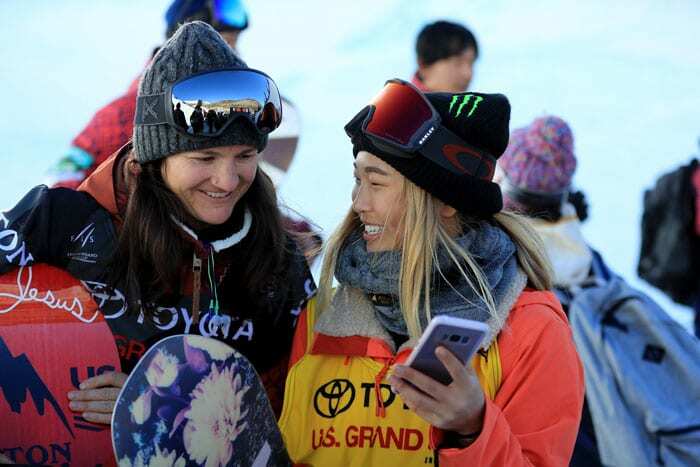 No matter when or where those relationships begin — Clark first met Chloe Kim when the youngster tugged on the vet’s sleeve in 2009 at Mammoth Mountain Resort, the home mountain for both Californian snowboarders — Clark realizes the opportunity before her. “A lot of the people that I come into contact with on a daily basis, they may never ever, ever step foot in a church, never have an opportunity to encounter God in any shape or form or fashion,” she says. “You know, maybe if they get to meet me and have the experience of an extension of who God is, that’s awesome. This story appears in the upcoming Action Sports/Summer 2018 issue of Sports Spectrum Magazine. Support this ministry and subscribe here.